Sometimes, to understand the opportunity you have, you must compare it to what you don’t have. Next year the Ducks play Stanford, Washington, USC and Auburn away from Autzen Stadium. With a new quarterback (no Justin Herbert) and without Troy Dye, Jalen Jelks, Ugo Amadi and Justin Hollins? Yikes. This year’s schedule by comparison is lined up as a dream for doing well, especially with those five players noted who will not be on the team in 2019. My prediction of 11 wins assumes only two losses the entire season, including the bowl game. This is not only an aggressive pick, but one that assumes the best Goldilocks scenarios for Oregon occurring. We must have luck with injuries, and I am counting on a number of question marks about the team to be answered in a positive way. Eleven wins is not a high probability, but it is fun to cheer for the best outcome. 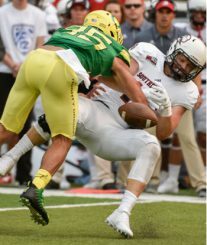 I am anticipating beating one of the two heavyweights that come to Eugene, Stanford and Washington, and losing one on the road that is unanticipated, such as at Utah or up in the Palouse. How can a victory come over one of the teams that has beaten us badly in the last two years? It will come from a mental edge that Oregon gets from not being “the hunted” at this moment. It is like Oregon going into Tempe last year to play Arizona State, a team known to have many offensive talents. While the Ducks respected them, it is hard to get “up” for a team you have beaten eight times in a row. I see a similar attitude in the Cardinal and especially the Huskies when they visit Autzen this year, and that helps the Ducks. 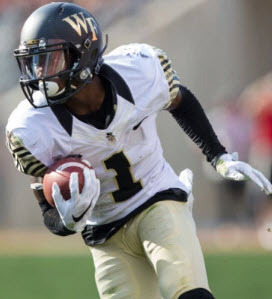 To me, the biggest reason for my change of prediction from eight wins to 11 is the presence of Tabari Hines, the graduate transfer receiver. 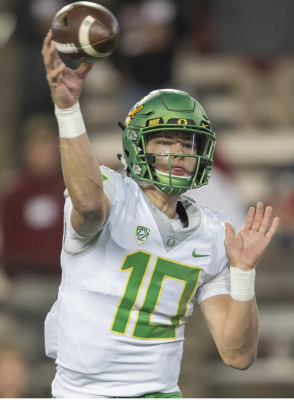 This fellow changes everything for the offense, as now the Ducks have a wide receiver who can get open when needed, and make the big play that Oregon lacks from their WR corps at present. He will open things up for the other receivers and tight ends, and thus the passing offense will flourish from his pressure on a defense. 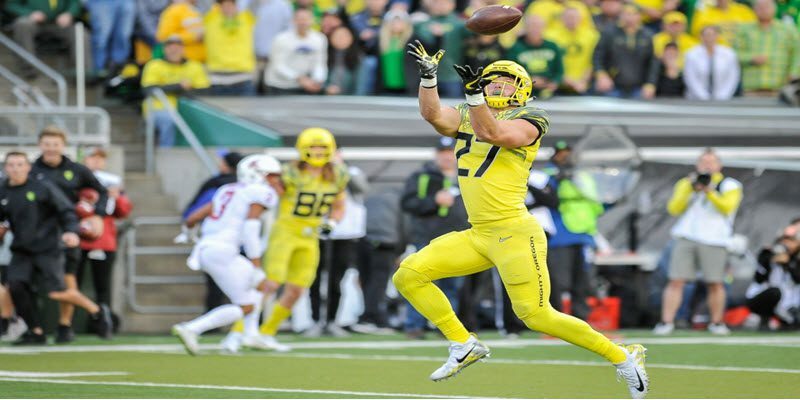 The impact of the new passing attack that can rack up yards on opponent defenses will open the running game up that much better, and the Ducks will score a boat-load of points as a result. Thus it will take some pressure off the Duck secondary, which is young and vulnerable as yet. Yep — all this from the addition of a receiver who has already caught passes for over 1,400 yards in his career. You cannot understate the importance of a proven WR who has faced Clemson and Florida State defensive backs and has succeeded. Experience matters. What COULD make it Rain in Autzen? A writer for this site (who has been quite knowledgeable in the past) revealed on the subscription site ScoopDuck.com (A site I suggest, as I am subscriber) that he has contact with two former players who have been to several practices and scrimmages in August. Oh crap. That is what Retired College Coach Ken Woody was telling us after the Boise State fiasco last winter. Geez, I hope that Cristobal carries out what he promised in the off-season, that he was looking for balance between passing and running, and balance between passing deep, intermediate and short routes. This is a major item to be looking for in the first three games. You are nodding … you’ve seen it too: passes thrown too hard, and yes, to me an important virtue of a QB to have — what makes him stand out — is to be able to have a quick release to rifle a pass, but make it catchable. That is what makes the elite QBs who have the best completion percentages. I hope that Herbert is coached into letting up on the macho stuff so he can move into elite status. Troy Dye makes a big hit! These are certainly aspects that could ruin my prediction, but in the end, my optimistic, bleeding-green side has to prevail and stick with a total of 11 wins between both the regular season and bowl the Ducks will play in. If that result should occur? There will be no ceiling too high for the future of Oregon football. I’m betting that this staff gets it done.